Enjoy exhilarating hikes through a magnificent nature with stunning landscapes of dramatic snow-capped peaks, picture-perfect alpine pastures and idyllic meadows. Touring the Mont Blanc, Europe’s heighest peak you walk through 3 different countries France, Italy and Switzerland each with their unique architectonic styles and cuisine, a rich variety of wildlife including marmots and chamois, and an extraordinary variety of flowers which bloom in their thousands in spring and summer. The walks on well-marked trails are satisfyingly long but never exhausting. 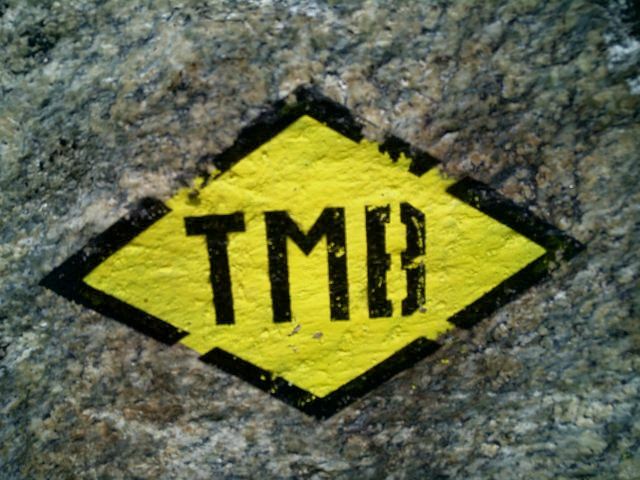 You follow well-marked hiking trails, with the lettering TMB (Tour du Mont Blanc). The route indications are in red and white stripes In France and at altitude in Switzerland, and with a black diamond shape on a yellow background in the valley of Italy and Switzerland. 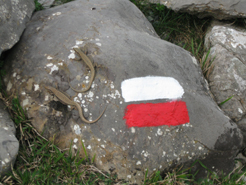 The markings are in both directions; they are made with paint and are easily visible. These marks are placed regularly on trees, rocks, walls, and fences, etc. The routes described here sometimes involve steep ascents and descents, but can be walked by a reasonably fit adult. Some stages are very long so we recommend always to carry enough food and water, and start off for the walks early in the morning. On some occasions there are optional opportunities for climbing local peaks; these are obviously more difficult trails, suitable only for experienced mountain hikers. NOTE: You can book this trip with UPGRADED HOTELS in double room. Please check with us for price difference. Day 11: Au revoir Chamonix! You then continue along an ancient Roman path and one of Europe's most famous trails, across blooming meadows and striking woodland to the refuge, a typical mountain chalet with a breath-taking view. Walkers are accommodated in small dormitories for between six to nine people and a hearty evening meal is served in the chalet's cosy dining room. Today is the longest and most demanding day of the holiday but definitely very scenic, with surprising landscapes all the way. After two days spent walking in France, today you go over the Col de la Seigne (2516m) and enter into Italy through the Val Veny. The day starts off with a climb through a deep gorge surrounded by vast pastures with lunar-like scenery as backdrop. The Col de la Seigne and the Aiguille des Glaciers mountains loom large in the distance on the border between Switzerland and Italy. Once over the top of the pass you descend into the Val Veny Valley on the opposite side of Mont Blanc, from where you can enjoy magnificent views of the snow-capped peaks. Depending on avaibility, today you may be booked at a nice Rifugio in La Les Blanche or at Courmayeur: if you are booked here, you will walk 5,5 kilometres to reach a bus stop in La Visaille where you will take a bus to Courmayeur. Today’s walk is divided into 2 parts; if you have slept in Rifugio Elisabetta, in the morning you will walk 5,5 km to the bus stop and descend towards the famous city of Courmayeur by bus. Courmayeur is a renowned ski resort where you can have a well-deserved rest before starting off again with a steep ascent followed by a level walk through meadows and conifer woods to Val Ferret, passing many small brooks, with the wonderful, awe-inspiring silhouette of the Grand Jorasses standing out. If you feel tired, or if you prefer to stroll through the streets of the centre, you can stop in Courmayeur and then take a bus directly to Val Ferret. This morning's walk will take you up a steep ascent and past ruined farmhouses. This marks the start of your journey into Switzerland. The first 4 or so kilometres are a gradual 150m ascent along a surfaced road. If you wish, you can avoid this section by taking the SAVDA bus that stops in front of the hotel. From Waypoint 4 a steep and rewarding climb takes you to Rifugio Elena then on to the border crossing with Switzerland, at the top of the Col du Gran Ferret (2537m). The views of the receding Glacier and the perennial snow of Triolet and Pre de Bar are imposing. The descent is through vast open meadows with very few traces of human settlement. You pass a couple of mountain huts then nearing the small hamlet of Ferret and on to La Fouly, the trail passes through idyllic scenery of forests, creeks and picturesque wooden bridges. You spend the night in the village of La Fouly. After the efforts of the last few days, today offers you an easier walk. This section is quite long, but the elevation gains and losses are not so pronounced. Starting off from La Fouly, you follow the river encountering a succession of woods, interrupted by cliff walls and small streams. You then walk through meadows to reach Les Arlaches, a beautiful hamlet with many traditional wood and stone houses. The last stretch is up a long winding climb, it's not too steep and there are interesting wood sculptures along the way to look at. At Orsieres the trail descends to Champex-Lac, a pretty mountain village situated on the lake. A spectacular walk over the Fenêtre d'Arpette (2665m) from where you descend along the Glacier du Trient. Trient (1300m) is a village on the pass road from Martigny to Chamonix. The trip and our services end after breakfast unless you have booked extra services or extra nights.The trip and our services end after breakfast unless you have booked extra services or extra nights. Overnight accommodation ranges from simple guest houses to mountain huts to family-run hotels, all surrounded by the beautiful peaks of the Mont Blanc massif. Several of the accommodations are mountain huts, with shared bathrooms, in some of them only dormitory is available. Some accommodation have double rooms with or without en-suite bathroom. During high season it is possible that you might sleep in different accommodation to the ones that are indicated below. In choosing alternative accommodation we have tried to maintain the same standards and quality. We have also tried to stay in the same towns and villages, in order to change routes as little as possible. Situated 45 minutes from Notre Dame de la Gorge, on the Tour of Mont Blanc walking route and the GR5, you will find a warm welcome and convivial atmosphere at the Nant Borrant chalet refuge, whether you stay the night or simply have lunch. This hotel was renamed Auberge de la Nova around 1970. Since then the hostel is an essential stopover on the Tour du Mont -Blanc, Tour du Beaufort, Tour du Tarentaise and many other excursions. Now managed by Muriel and Erick, this small hostel nestled in the mountains is a major rendezvous point for hikers, cyclists and nature lovers. Cozy dorms and relaxing hot showers will make sense of your tiredness. Half board service (dinner-breakfast-dorm). At lunch, in addition to the formidable appetizers and pasta dishes, we offer our cuisine on losa. Very plush refuge with stunning views back over the Mont Blanc massif. Situated in the Val Ferret valley in Italy at the mouth of the vallee de Malatra. Beds are provided with blankets and pillows but for hygiene reasons you must provide your own sheet or sleeping bag liner (they can also be rented at the refuge depending on availability). Maya-Joie is 200 meters from the Fouly station in Val Ferret at an altitude of 1,700 m. Set in a tranquil haven surrounded by lush greenery. This countryside location, facing Mont Dolent, provides a relaxing environment for one or more nights. Accommodation in rooms with 1 to 8 beds. Bunk beds or double beds. Showers and washrooms upstairs. Wifi Room, reading room, conference room, terrace with deckchairs. Lise, as well as all her team, look forward to welcoming you to this accommodation. In summer as in winter, the atmosphere is always warm and very friendly. Formerly, la Grande Ourse was a hotel and then it became a country house of the Movement of the Suisse Romande Youth. Today the hotel has been completely renovated. The new owner is Mr. Jasiqi Azem. Would you like to spend a pleasant stay and be welcomed by a warm team? Located 8 km from the center of Chamonix, and 10 minutes walking from the village of Argentière in Chamonix Valley. You can start on any day of the week, subject to availability, between the 15th of June and the 30th of September. We strongly advice to start on Tuesday, Wednesday Thursday or Friday, as availability in different accommodations will be better. If you travel by plane, the main airport you could flight in to reach the start of the Mont Blanc walking tour is Genève, in Switzerland. There is a regular bus service from Genève airport (GVO) to Les Contamines (www.sat-montblanc.com), trip can last from 1 hour 45 minutes to 2 hours 30 minutes; also possible is to prebook a private transfer (www.alpybus.com). If you travel per train: There are regional train and TGV high-speed mainline train connections from St Gervais-le Fayet railway station, just 20km away. From there take the connection to Gare Chamonix – Mont Blanc.